A visit to the Ebbetts Pass Fire District Station # 1 can be fun and educational for students, teachers and parents alike. 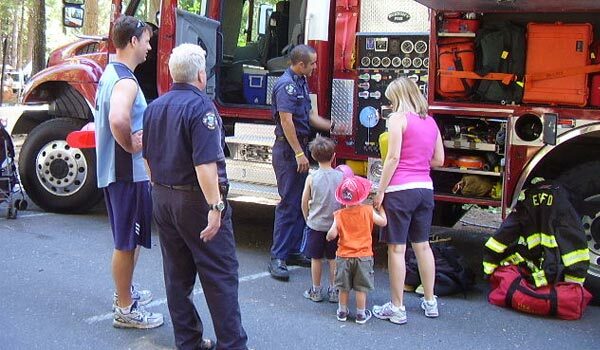 Classes or groups of 30 or fewer (including adults and children) can tour the fire station. Two week advance notice is appreciated. To schedule a visit, call the Ebbetts Pass Fire District at (209) 795-1646 during regular weekday business hours, (8:00 a.m. to 5:00 p.m.). For pre-school age children please have at least one adult to every five children. NOTE: Tours are subject to Fire Department confirmation and alarm response. Have 15 or so children or students participate. A fire engine and ambulance will be made available at your location and the children or students will get a chance to tour the engine and ambulance. They will also get a chance to talk to the firefighters, paramedics, and “Jasper – the Firehouse Cat” (if he is available). If you want Jasper to visit along with the engine, make arrangements when you request the engine, or Jasper will stay at the firehouse and perform his daily firehouse duties. 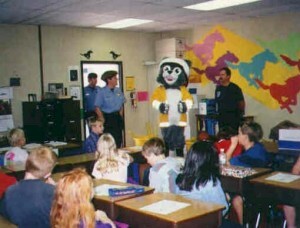 Engine and “Jasper – the Firehouse Cat” visits are about 20 – 30 minutes long. During the visit, a fire fighter will suit up in full “Turnout gear with a Self-Contained Breathing Apparatus”, so that children can see the special fire protective clothes and hear the sounds that firefighters make when they fight fires. Children might even get to hold a fire hose and spray water from the fire engine if there is time. If you are conducting an event that is community or public safety oriented, the Ebbetts Pass Fire District will try to honor special requests to send a fire engine and ambulance to your event. To schedule a visit to your event call the Ebbetts Pass Fire District at (209) 795-1646 during regular weekday business hours, (8:00 a.m. – 5:00 p.m.).